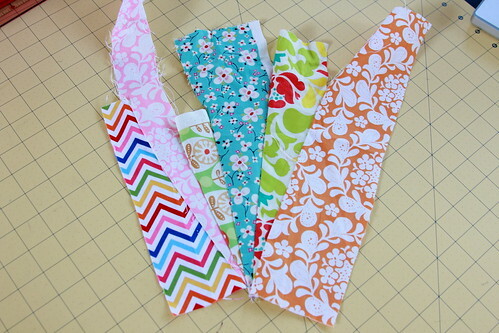 Welcome to all the new readers that are coming over from Erin's blog to check out my tutorial for Mug Rug Madness. Hasn't all the tutorials been awesome??? Well I hope you have fun with mine. I decided to do a tutorial on a smaller version of the placemats I made for the Spicing Up The Kitchen Swap since I just loved them. Remember you can make this for a quilt block,pillow, quilt or whatever you want just trim the scraps to be the size that you want it to be! It doesn't have to be a Mug Rug. 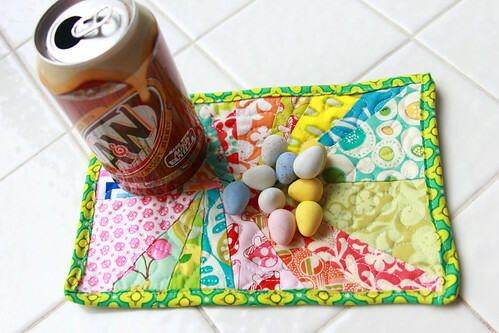 You will need lots of scraps for this mug rug. 1. 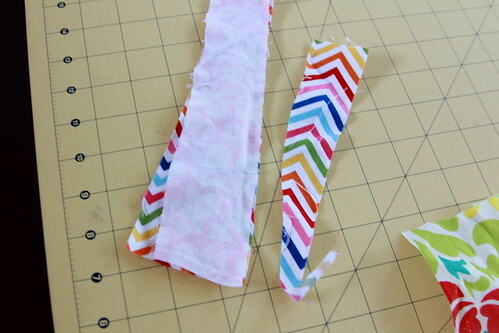 Take your first 2 scraps and lay them right sides together with the corner points matching up. 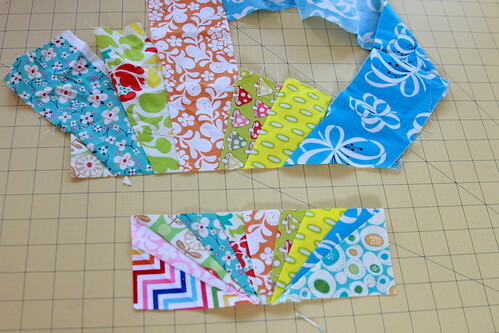 Lay the top scrap/fabric at an angle. 2. 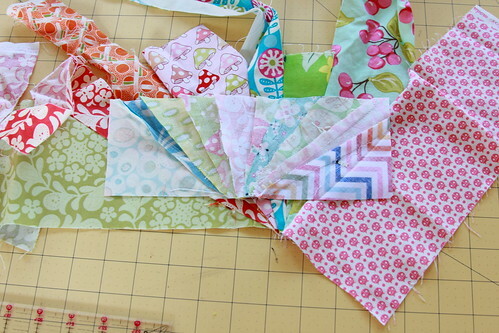 Sew them together on the diagonal. Trim off access. 3. 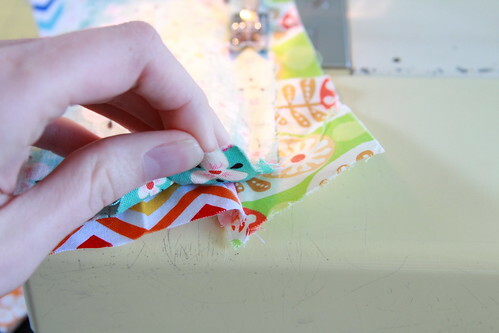 Sew more strips together but make sure that each time you are laying the points on top of eachother and trimming off the access so it doesn't get really bulky. 4. 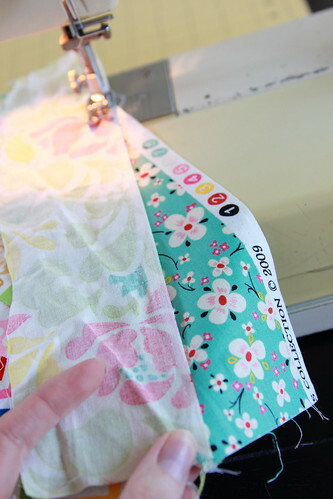 As you sew the strips together I find it easier to hold the new strip at the corner where it meets the other points to make sure that when I sew the points are all together. Hopefully that makes sense this picture will help. 5. Now you should have strips sewn together in an arch. Make sure you iron it all flat so that when you trim you will get the right measurement. A good stopping point is when the strips are 9" wide. 6. Get your ruler and trim. You need to trim so that you have a straight line at the bottom. 7. Trim so that you have a rectangle. Desired size is 9"x 3". 8. 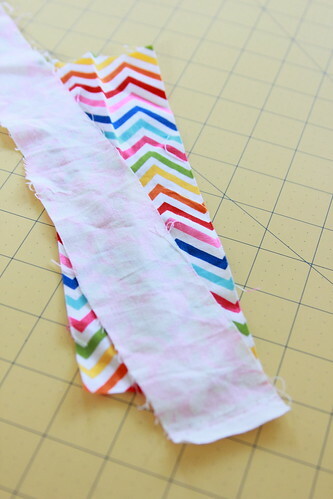 Sew another set of strips together just as you did before don't trim. 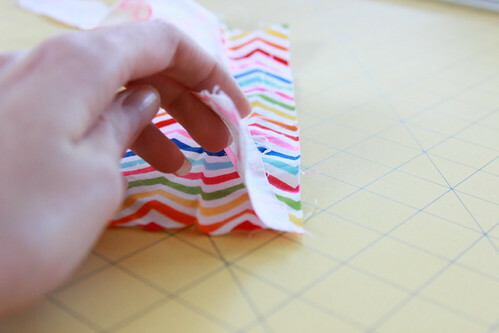 Lay the trimmed rectangle on top of your strips right sides together. This is the part where I make mine wonky. Before I trim I make sure I lay the trimmed one on top with the centers NOT matching up so that it will be wonky. ( of course you can match them up if you don't like wonkiness). Then I trim at 9" x 3". 9. Now you should have 2 rectangles where the centers do not match up. Sew them together. Right sides together. There you go! All you do now is Baste and quilt it. I used free motion quilting to help all the seams and some bulk to lay flat. Then for the binding I cut mine at 2" but it was really tight and I wish I had done 2.75" I will next time. Now you are all ready to use your mug rug. Make sure you grab your favorite drink, Rootbeer for me, and a snack. Since it is Easter season my favorite candy ever is out right now Cadbury eggs and I devour them! 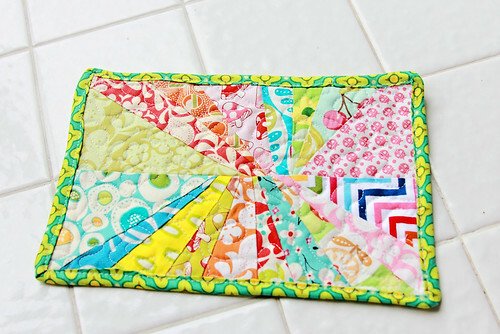 Don't forget to go to this post to enter the giveaway and you might be the lucky winner of the mug rug I made! Thanks so much Erin for asking me to join in Mug Rug Madness. I love the mug rugs you made! The colors are so sunny, they cheer me up! How cute! Great way to use up those scraps. Great tutorial too. Love... with a capital "L"... LOVE this mug rug idea! It will be happening at my house very soon... thanks for the great tutorial!!! Mug Rug Madness is so fun! I have a new favorite every day! I love the scrappy goodness of this one. Definitely my favorite of the week and I will be making one! Thanks! What a cool selection of colors. Makes me think of summer. Love it. Wonderful! AND the most fabulous drink and snack combo I've seen. This is adorable. Love the colors :) Thank-you for the tutorial! 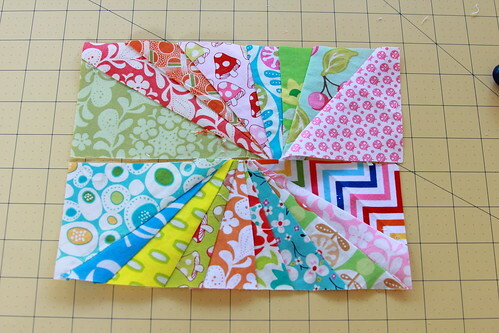 OK, Darci...I'm headed to my sewing cave to make this mug rug. I already have my Coke and Cadbury Eggs ready. Great tutorial! Thanks for the tutorial. I really like the wonkiness and how the points don't meet in the center. I love, love, love this one! The wonky middle, the starburst lines and the bright colours. This made it straight to the top of my list of tutorials to try! That's adorable. Thanks for the tutorial! I love this and it looks so simple! i love love love your wonky, scrappy starbursts Darci! I love your design. Nothing to measure intil the end, and then it looks great. Thanks for sharing, Darci. I really like this one! Love the design. Will have to give it a try. All I have to say is mmm A&W...sorry I couldn't help it! Darci I really enjoyed this mug rug....I love all the bright colors. Thank you and you have a wonderful blog. Love this project. Well I love playing in my scrap bag. I just finished my first one. I am not sure what I like more- the snack or the snack mat/mug rug! Those are my favorite candies too! My hubby just picked up 6 more bags so I have a stash to get me through Easter. Ha ha. They won't last a week! 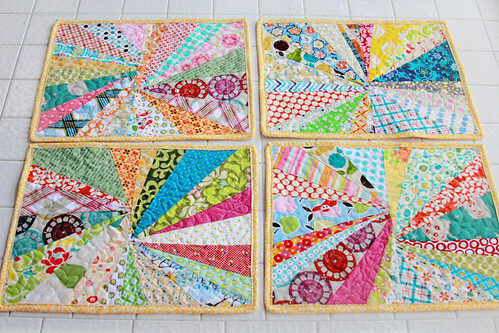 I love the wonky mat- the starburst is one of my favorite blocks, I have a quilt going right now with that design. Lovely job! 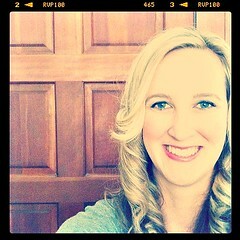 Thank to Jodi from Pleasant Home I found another great blog!! 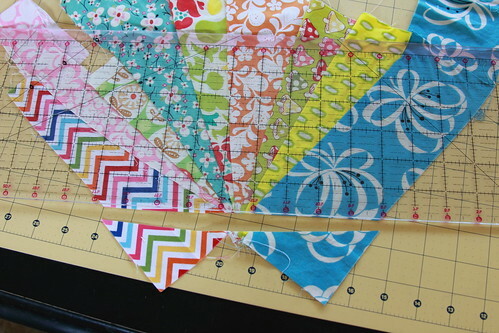 It's a nice tutorial for mug rugs: I love to use up my scraps!! 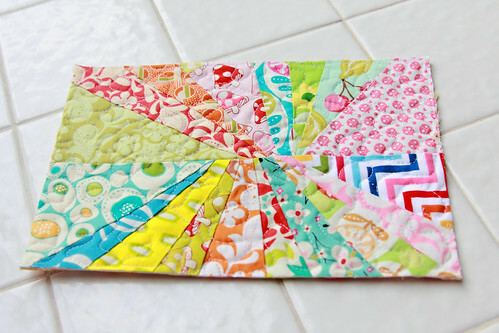 Great tutorial and a perfect uses for those smaller scraps. 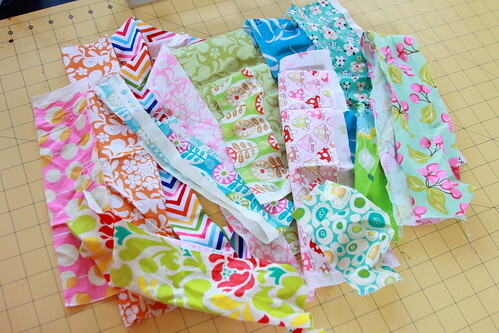 I am into my scraps at present. I love your pattern. Thanks for the tutorial. This was great! The designs are so creative and fresh! Too cute. I have to make this! I love this idea and your tutorial is so easy to follow...thank you! I think I'll add a batting filler and backing to mine to finish it off and make it more absorbent.Did you use a backing? Great technique!! Thanks for sharing! Love it. Can't wait to make one. Thanks for sharing.